Want To Reduce Your Risk of Getting Wet Macular Degeneration? My father-in-law who is 85 has wet macular degeneration. Why did he develop this more advanced form of AMD, when many of his friends don't have it, is of course something that he wonders about. Although he only smoked a few years when he was young, he did have several other risk factors for macular degeneration. One of them was high blood pressure. David Boyer, M.D. the author of the latest macular degeneration book, Macular Degeneration: From Diagnosis to Treatment writes, "For people with uncontrolled hypertension (above 160/95), the risk (of developing macular degeneration) is three times greater than for people with normal blood pressure. Hypertension has also been linked with an increased risk for wet macular degeneration and a more rapid progression of this disease." As you know high blood pressure, or hypertension, is when the force of the blood pushing against the artery walls is above normal. It is kind of like having the water spigot to your hose opened all the way with so that the water pressure is at full force. High blood pressure causes damage to blood vessels throughout the body, including the tiny vessels that supply blood to the retina. This means that hypertension is a systemic disease - a disease that affects the whole body - including our eyes. Changes in your retinal blood vessels can be detected during a routine eye exam. Your eye care professional may be able to identify hypertension without even using a blood pressure cuff. Just by looking at the capillaries, hypertension can be diagnosed. The eye is the only place in the body that allows physicians to actually see and check the condition of your blood vessels without any type of invasive technique. To see inside your eye, the doctor looks through a lighted magnifier called an ophthalmoscope. By dilating the pupils first, the doctor has a better view of the retina, the optic nerve and the blood vessels. This is how the doctor is able to determine the health of your retina and to check for microvascular changes such as thickening or narrowing of the vessels. In some cases the small capillaries burst from the high pressure. 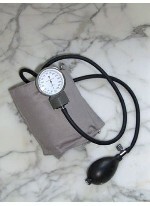 Of course you don’t need to just rely on your eye doctor to determine if your blood pressure numbers are creeping up. Knowing your blood pressure numbers and what they mean are important ways to care for your health, to care for your eyes and to reduce your risk of developing wet macular degeneration.